Is There Such a Thing as ‘Too Young’? Many people believe that there is no such thing as ‘too young’ when it comes to teaching children to swim. But generally speaking, anywhere between the ages of two and four is a good time to teach your children how to swim. Just remember to be present when your child is first learning to swim, as it is a very dramatic experience. To start, make sure you purchase all the required water-safety equipment. Some parents and children feel more comfortable when using floaties, whereas others think that it’s a crutch that will stunt your child’s swimming progress. It’s really up to you how you approach this situation. As mentioned above, there is a danger of your children becoming overly dependent on floaties and other water-safety gear. If you want to use floating devices to help your child get in the water initially, make sure you slowly wean them off when they start showing signs of confidence. If you take too long, they may be dependent on the devices forever. Also ensure that the area around the pool is clear of any unnecessary equipment such as Frisbees, buckets, hand tools, or any other objects found in the backyard. If you don’t exude confidence when teaching your child how to swim, chances are they won’t be confident in the water either. If your young ones know that Mum and Dad can help them if they are in trouble, they will be much more comfortable in the water. It goes without saying that it is very important that you yourself know how to swim. If you don’t know how to swim, then this is the perfect time to learn. Teaching your kids to swim is only half the battle; you should also teach them about being safe around the pool. This means no running or sliding around the pool, no backflips or dangerous stunts, no swimming without an adult present and no dunking. It’s a good idea to teach your child CPR once they have got the hang of swimming. Swimming is lots of fun and a great way to keep healthy. 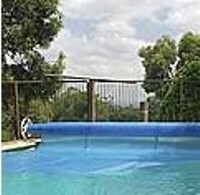 During the summer months, millions of Australians of all ages spend their weekends relaxing by the pool. So the sooner your kids know how to swim, the better!